The five fragments are part of a 16-piece Dead Sea Scrolls collection at the Washington, D.C., museum. 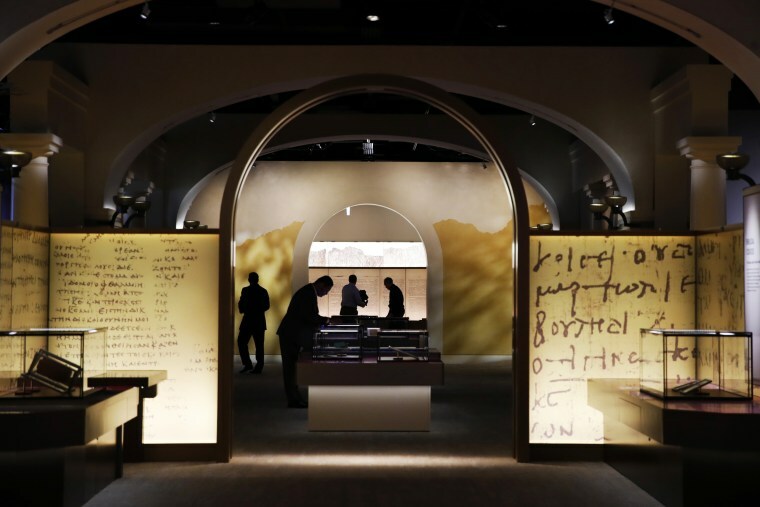 The Museum of the Bible is withdrawing five fragments it had thought were part of the Dead Sea Scrolls after lab tests indicated that they could be fakes. The museum in Washington, D.C., said in a statement Monday that it sent the fragments for testing to a lab in Germany in April 2017 and had learned that the five fragments "show characteristics inconsistent with ancient origin." "Though we had hoped the testing would render different results, this is an opportunity to educate the public on the importance of verifying the authenticity of rare biblical artifacts, the elaborate testing process undertaken and our commitment to transparency," said Jeffrey Kloha, the museum's chief curatorial officer. The five artifacts have been withdrawn from display and will be replaced with three other pieces, the museum said. When the museum opened last November, a sign accompanying some of the fragments read: "Are these fragments real? Research continues." The findings add to two other studies of the museum’s 16-piece Dead Sea Scrolls collection. For the most recent study, Germany's Federal Institute for Materials Research and Testing ran "material analysis of the ink, sediment layers and chemical nature of the sediment" from the five scrolls and concluded that the piece may not have been authentic, after all. The museum has since presented the findings as a lesson in verification and transparency. "The museum continues to support and encourage research on these objects and others in its collection, both to inform the public about leading-edge research methods and ensure our exhibits are presenting the most accurate and updated information," Kloha said. November 2017: Museum of the Bible opens in Washington D.C. The $500 million museum has had its fair share of criticism since it opened its doors in the nation's capital — most of it from its chairman, Steve Green, the billionaire president of Hobby Lobby, which bought thousands of smuggled Iraqi artifacts in 2010. The Green family has been known for its biblical collection — at one point boasting almost 40,000 artifacts from historical lands. But Hobby Lobby, through the family's acquisitions, fell into hot water after federal authorities found that the Greens failed to heed caution when buying the smuggled Iraqi goods. At the time, Green said the purchase had been a mistake and blamed it on inexperience. The company settled with the Justice Department for $3 million in July 2017. Although the museum was founded by Green, the nonprofit remains a separate legal entity from the private Christian retailer, and it has rebutted claims that any of the items from the Hobby Lobby settlement are used in the museum. Green didn't immediately reply to requests for comment. The 430,000-square-foot facility boasts features like The New Testament Theater and pages from the Gutenberg Bible. Early critics of the facility remained skeptical of the museum's purpose, questioning whether it was a promotional tool for Green's form of evangelical Christianity or for Hobby Lobby. Green has denied the claims.